Dr Luke McDonagh was a guest of the China Association of Performing Arts (CAPA). On September 6th, Researcher in Intellectual Property Law and Senior Lecturer in the City Law School, Dr Luke McDonagh, was invited by the China Association of Performing Arts (CAPA) to speak on the topic, How Arts organisations can generate revenue from Intellectual Property. Dr McDonagh was delighted to have been invited to the event at the 2018 China Performing Arts ExPo, which came about through his involvement in the interdisciplinary Boosting Resilience project. Titled, ‘Boosting Resilience: Survival Skills for the New Normal', the two-year Executive Learning programme running from 2017 to 2019, aims to enable senior staff from England-based arts and cultural organisations, music education hubs, museums and library services, to develop new approaches to making the most of Creative Assets and Intellectual Property. 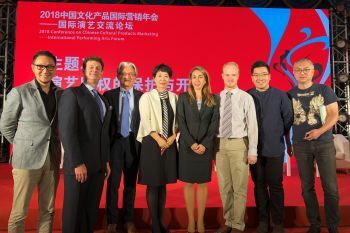 ‘It’s wonderful to see exciting opportunities like Dr McDonagh’s presentation in China emerge out of alliances with colleagues”, says Dr Sara Jones, Boosting Resilience’s Principal Investigator and Senior Lecturer at Cass Business School.